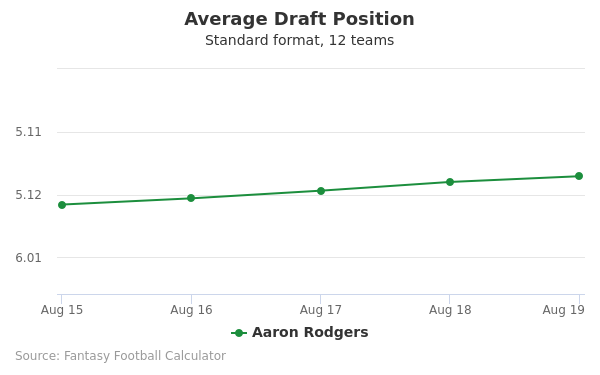 Aaron Rodgers's fantasy value is measured by his average draft position (ADP) in fantasy football mock drafts. 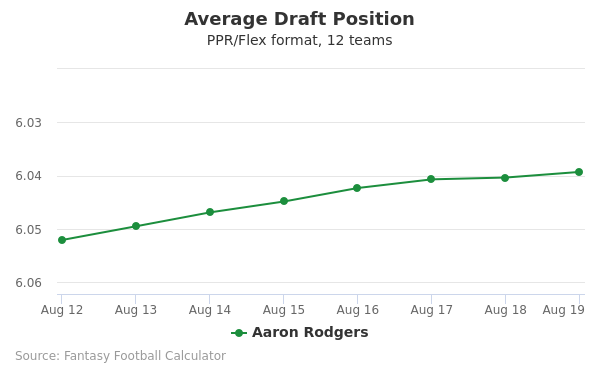 In recent drafts, Rodgers's current ADP is 4.03, which indicates that his fantasy outlook is to be the 3rd pick of the 4th round, and 39th selection overall. 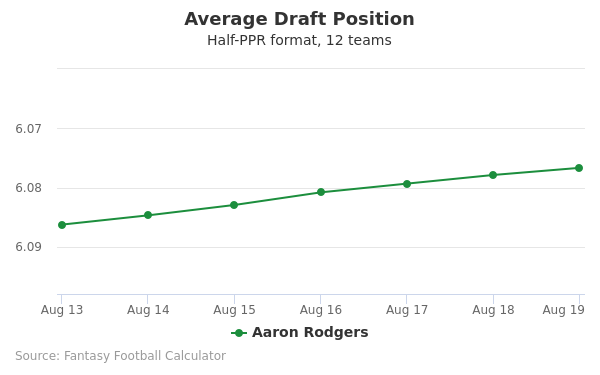 The code below will display a graph that updates every day to show the ADP data for Aaron Rodgers for the past 30 days in 12-team PPR leagues. Draft Aaron Rodgers or Devonta Freeman? Draft Aaron Rodgers or Chris Carson? Draft Aaron Rodgers or Brandin Cooks? Draft Aaron Rodgers or Derrius Guice? Draft Aaron Rodgers or Kenny Golladay? Draft Aaron Rodgers or Andrew Luck? Draft Aaron Rodgers or Kerryon Johnson? Draft Aaron Rodgers or Cooper Kupp? Draft Aaron Rodgers or Eric Ebron? Draft Aaron Rodgers or Robert Woods? Draft Aaron Rodgers or Julian Edelman? Draft Aaron Rodgers or Tarik Cohen? Draft Aaron Rodgers or Baker Mayfield? Draft Aaron Rodgers or Jarvis Landry? Draft Aaron Rodgers or Alshon Jeffery? Draft Aaron Rodgers or O.J. Howard? Draft Aaron Rodgers or Tyler Boyd? Draft Aaron Rodgers or Tevin Coleman? Draft Aaron Rodgers or Kenyan Drake? Draft Aaron Rodgers or Will Fuller? Draft Aaron Rodgers or Deshaun Watson? Draft Aaron Rodgers or Chris Godwin? Draft Aaron Rodgers or Evan Engram? Draft Aaron Rodgers or Calvin Ridley? Draft Aaron Rodgers or James White? Start Aaron Rodgers or Devonta Freeman? Start Aaron Rodgers or Chris Carson? Start Aaron Rodgers or Brandin Cooks? Start Aaron Rodgers or Derrius Guice? Start Aaron Rodgers or Kenny Golladay? Start Aaron Rodgers or Andrew Luck? Start Aaron Rodgers or Kerryon Johnson? Start Aaron Rodgers or Cooper Kupp? Start Aaron Rodgers or Eric Ebron? Start Aaron Rodgers or Robert Woods? Start Aaron Rodgers or Julian Edelman? Start Aaron Rodgers or Tarik Cohen? Start Aaron Rodgers or Baker Mayfield? 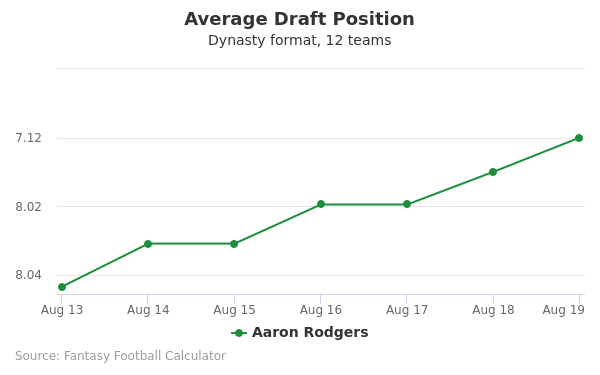 Start Aaron Rodgers or Jarvis Landry? Start Aaron Rodgers or Alshon Jeffery? Start Aaron Rodgers or O.J. Howard? Start Aaron Rodgers or Tyler Boyd? Start Aaron Rodgers or Tevin Coleman? Start Aaron Rodgers or Kenyan Drake? Start Aaron Rodgers or Will Fuller? Start Aaron Rodgers or Deshaun Watson? Start Aaron Rodgers or Chris Godwin? Start Aaron Rodgers or Evan Engram? Start Aaron Rodgers or Calvin Ridley? Start Aaron Rodgers or James White? Born on December 2, 1983 in Chico, California, Aaron Charles Rodgers also lived with his family in Ukiah, California and Beaverton, Oregon during his childhood before they returned to Chico. His father had played as an offensive lineman for the Chico State Wildcats in the 1970s. Rodgers played quarterback for Pleasant Valley High School in Chico where he racked up 4,421 passing yards and set multiple records. Rodgers graduated in 2002. He also excelled in baseball and basketball as a child. After attending Butte Community College near Chico for a year, where he led the team to a 10-1 record, Rodgers transferred to the University of California at Berkeley on an athletic scholarship. He played for the team during 2003 and 2004 season and led the Golden Bears to a 7-3 record. He was doing well until being injured that year but still managed to set various records. He led the fourth-ranked team to the 2004 Holiday Bowl, but they lost that game. Rodgers went pro rather than completing his senior year. Rodgers' college career included some incredible highlights. At the NFL Combine, Rodgers completed a 34.5-inch vertical leap, and his 40 time was 4.71 seconds. During the 2005 NFL draft, Rodgers was the number 24 pick and was drafted as a backup rookie to Brett Favre with the Green Bay Packers. Rodgers' jersey number is 12. When Favre announced in 2008 that he was retiring as the Packers' quarterback, this paved the way for the position to be open to Rodgers. He has been starting quarterback since that time. In 2013, Rodgers became the football player with the highest salary in the history of the NFL with a 5-year, $110-million contract extension. Rodgers had led the Packers to a Super Bowl victory in 2011 and continued to excel throughout the years. During the 2015 to 2016 season he threw for 3,821 yards, managed 31 touchdowns, and threw only 8 interceptions. He completed 60.7 of his passes and averaged only 6.7 yards per pass attempt. He finished with a passer rating of 92.7. Although overall this was not considered a great year for Rodgers, he still led the team to the NFC playoffs. They made it to the divisional round before being defeated by the Arizona Cardinals. Rodgers played in the Pro Bowl and was ranked the sixth best player in the entire NFL. The 2015-2016 season was memorable for the quarterback, with certain plays making it especially so. The 2016 season marked Rodgers' 12th season for #12 with the Green Bay Packers. At that point he had played for the team for his entire career as he capably followed in the footsteps of Hall of Famer Brett Favre. In the most recent season, the Packers made it to playoffs for the 8th consecutive season but lost to the Super Bowl-bound Atlanta Falcons. Rodgers played somewhat inconsistently this season, doing really well in some games and not as well in other games. He ended the season with 401 completions and 610 attempts. Rodgers played in his third consecutive Pro Bowl in 2016. His 2016-2017 season with the Packers included some notable and memorable plays. Rodgers lives in the suburbs of Green Bay and has another home in Del Mar, California. He is passionate about his Christian faith. December 12, 2012 (12/12/12) was known as Aaron Rodgers Day in Wisconsin. Rodgers' signature touchdown celebration move the Victory Belt is also known as the Championship Belt. He has dated actress Olivia Munn since 2014. He has two brothers, and Jordan was quarterback for Vanderbilt University and played for the Jacksonville Jaguars and Tampa Bay Buccaneers. Various celebrities like pop superstar singer Harry Styles of the group One Direction have been fans of Rodgers and the Packers. Rodgers has displayed his great sense of humor while appearing in various TV commercials such as ones for State Farm home and auto insurance. He has also been in Pizza Hut commercials. He has been active in charity work. Rodgers' Twitter username is @AaronRodgers12.